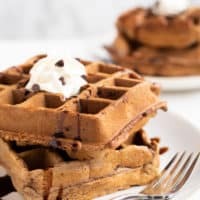 How to Fold Ingredients + Cocoa Waffles | Good. Food. Stories. Thanks to the Clinton St. Baking Company Cookbook, I now know the secret to making the greatest pancakes and waffles for weekend brunches. It’s not a special kind of flour or an obscure spice. It’s not the act of adding fresh cherries or shaved chocolate to the crowns of my golden rounds (although that certainly doesn’t turn anyone away at my table). No, the best stacks of breakfast classics come from the simple act of folding. What the heck does ‘folding’ mean anyway? Folding refers to the technique of gently mixing one light and airy ingredient (usually egg whites) into another, denser, ingredient (usually a batter) so that the entire conglomeration stays fluffy when cooked. It’s most often seen in recipe instructions for soufflés, chiffon cakes, and angel food cakes. These types of desserts use the frothy, air-bubble-filled protein structure of beaten egg whites to give them a light texture and help them rise sky-high. Folding is simple to master because, for once, this is a technique that doesn’t ask you to rely on speed or precision for success. In fact, this is the cooking equivalent of a tortoise—slow and steady wins the race every time when it comes to folding. In a large bowl filled with the denser of your two ingredients, spoon about half the lighter ingredient on top. 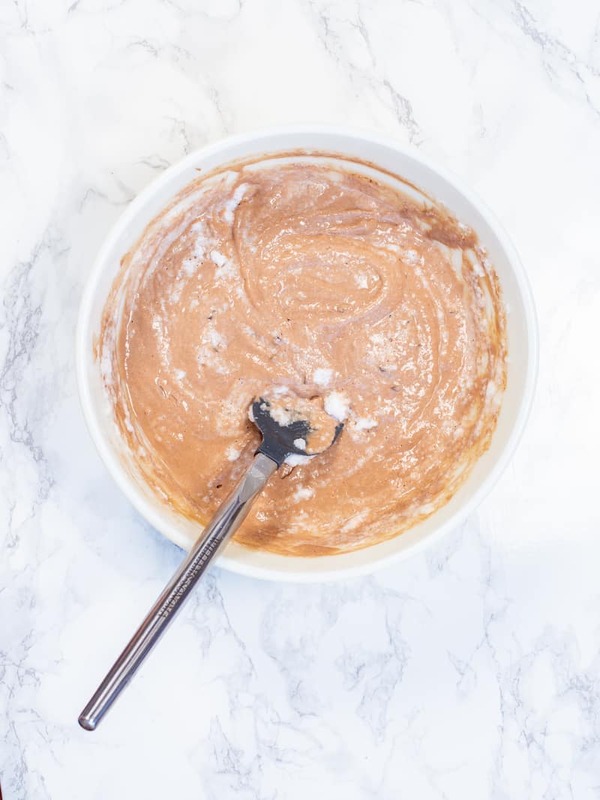 Sink your mixing utensil down into the center of the bowl and pull out to scrape the side of the bowl and fold the batter over on itself in a swooping, scooping motion. I use a spoonula—the chunky spatula with one curved side and one flat side—to hug the side of the bowl as I swoop and plop the batter into the center of the bowl as I scoop. I also find that turning the bowl slightly as I fold helps the process. It may take a few minutes to fully incorporate your two ingredients, but the gentle motion is significant (notice I said “gentle” quite a few times in this post?). You don’t want to disturb the air bubbles in your whipped egg whites, if that’s what you’re folding in, or overbeat the entire mixture so it becomes gummy. Folding brings everything just to the point of homogenization, which is where the magic happens when it hits the heat. Watch the video below for an example how to fold ingredients in action. Now it’s your turn: try your hand at folding with the following recipe for cocoa-infused waffles. 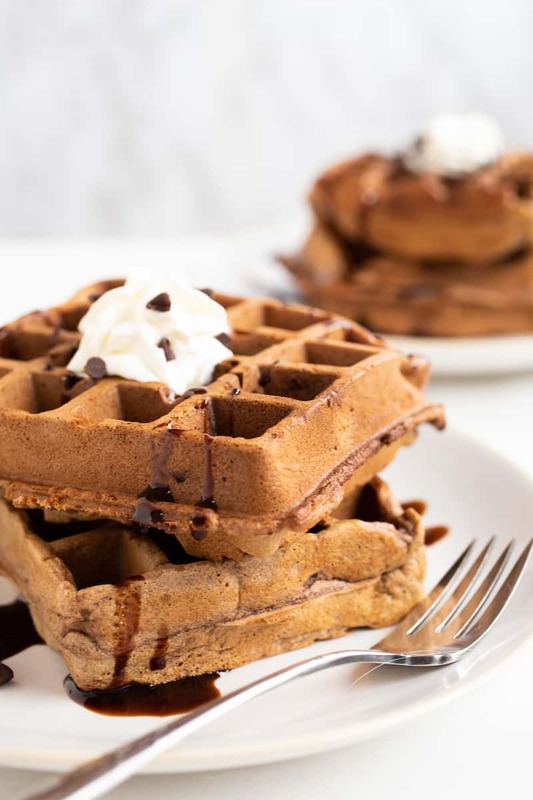 Truthfully, I added the cocoa powder to the batter in the video so my dear readers would be able to see the contrast against the whipped egg whites as the two were folded together, but the recipe thankfully makes a light and crispy, slightly savory waffle in its own right. Serve with your usual breakfast condiments or with whipped cream and chocolate sauce as an unexpected dessert. 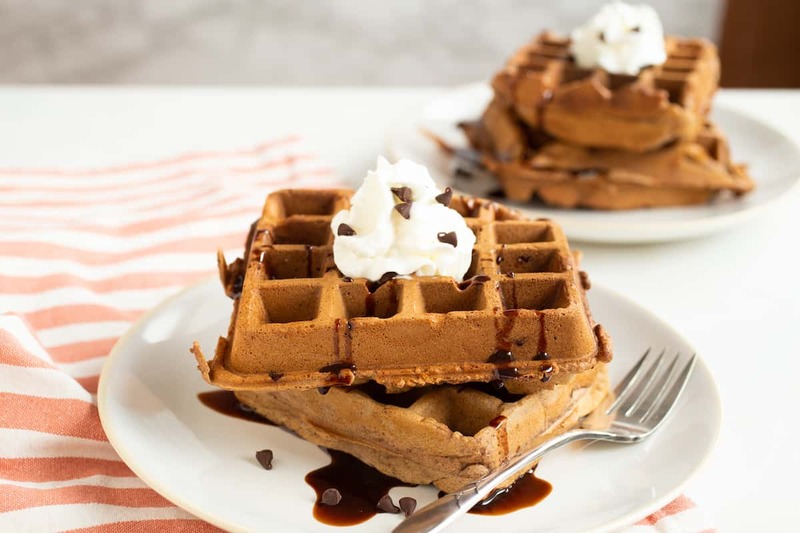 Cocoa waffles are light and crispy with just a hint of sweetness from mini chocolate chips. And they're very fluffy, thanks to folded egg whites in the batter. Whisk together the flour, sugar, cocoa powder, baking powder, and salt in a large bowl. Whisk together the milk, buttermilk, melted butter, and egg yolks in a small bowl, then stir into the dry ingredients until combined into a slightly lumpy batter. With a stand mixer fitted with the whisk attachment or a handheld electric mixer, whip the egg whites until soft peaks form when you pull the beaters out of the eggs. The egg whites will still be droopy; don't overwhip! 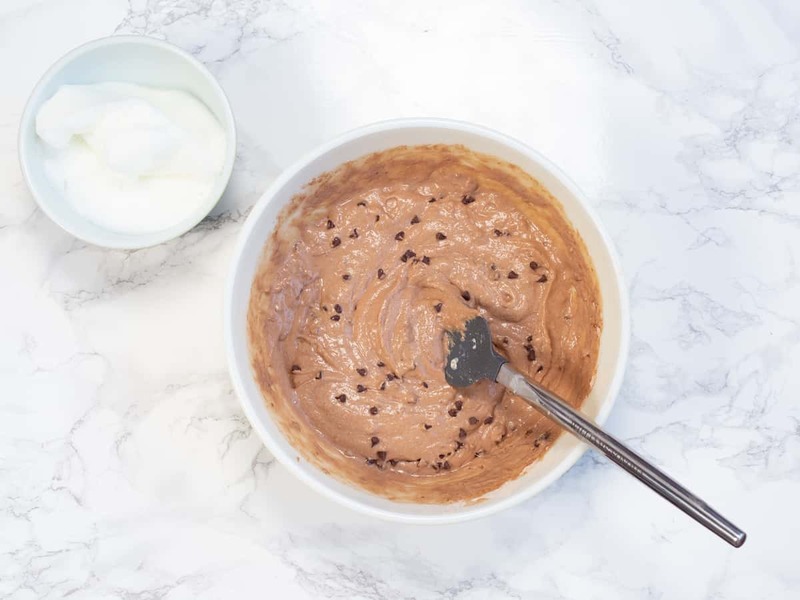 Slowly fold the egg whites into the cocoa batter until well combined—it's perfectly fine if there are a few chunks of unincorporated egg whites in the bowl. Heat your waffle iron and cook your waffles according to your appliance's specifications. For me, that's 1/4 cup of batter on a piping-hot iron, cooked for about 5 minutes. Your mileage may vary. 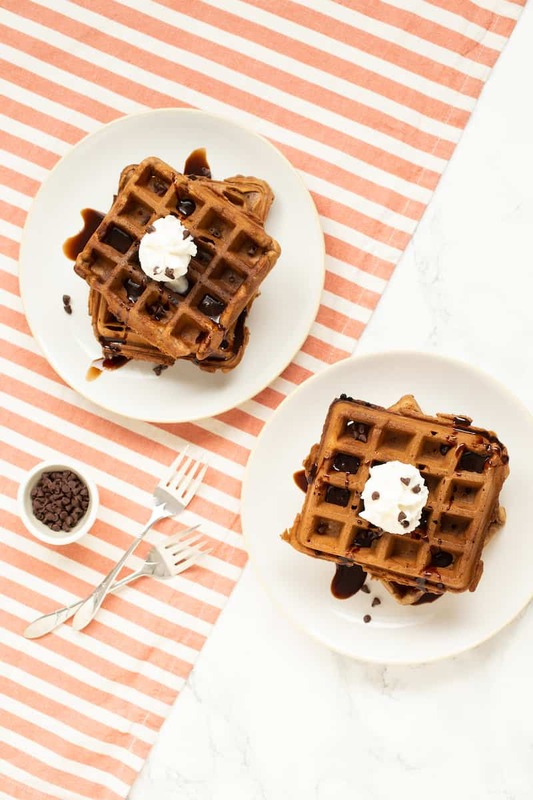 To freeze leftover waffles, place a wire cooling rack on a rimmed baking sheet and freeze the waffles on the rack until completely frozen through. Wrap in foil or transfer to a freezer bag. Reheat in a toaster oven until warmed and crispy.